The saying goes, "Under Heaven Shaolin is the Mother of Martial Arts" and "One Hundred Flowers come from Shaolin." It's a wonderful thought and we studied Shaolin for many years but it isn't true. Shaolin is now such a generic phrase and so overused as to be of very little use. Still there are some indications of styles which are probably "closer" to the core and meaning of the system. Shaolin is, in reality, a Middle Fist not a Long Fist though it is generally categorized as such. It is a huge style with over 200 staff sets and the temple itself was more of a repository for centuries of martial artists: sort of a living library of Alexandria. In this sense Shaolin is indeed an important and historically significant style. It is also often beautiful and "honest"; a style of contrasts and movements known throughout the world. I’ll be truthful, no matter the degree of expertise, the idea of two quick and intense students practicing with two live spears is worrisome to me. That aside, this is one of the rare spear fight choreographies I have seen. This comes from one of Shaolin Temple’s main sub-division: Liu He, or Six Harmony movements that, in the Shaolin vocabulary, often presage duet partner forms. According to this viewpoint, Shaolin Liu He spear contributed to the skills of other honored styles such as Yang Family, Luo Family, and Yue Family. Background, from the Shaolin Anecdotes: “All of them held the stick which was seven feet long, 30 jin in weight, and swift like a bamboo rod. The warriors were so brave that if any soldier be ahead of the field, he would act as a vanguard…” This I take to mean that any soldier might, like a flag bearer, take up the lead of the advance. Anyway, this is considered a precious technique in the Shaolin arsenal. Chinese martial training is a treasure-house of methods. Good evidence of this is how, presently, the exercise community is stealing every thing it can from the treasure, to keep up with “exercise channels” and a starving market for people fleeing the boredom. Not all the methods in this book are solely martial, but each has a possible benefit. Some enhance perceptual skills such as eye and balance routines. Some are just plain difficult. Many are strength, endurance or conditioning techniques. These all come from a famous little textbook describing these exercises. My only critical point is that all of the line drawings demonstrating the conditioning are public domain and might have been included in their entirety. Some skills are for Iron Palm, some for upper body strength, many emphasize Chin Na power. Lots of training routines, some of them slightly crazy. Again, we have a case of a good-attempted translation, I believe, from Chinese to Russian to English, with occasional slips, mostly on English idioms. On the other hand, the narration and presentation gives a “voice” that makes it easy to forget minor errors. This is Volume 1 of a proposed series on Northern Shaolin. It contains history and development of Shaolin style Kung Fu. It records the “melting pot” version of history where Shaolin is not so much a style as an archive of hundreds of forms and dozens of sub-systems. This text, recognized as Shaolin, moves through the lineage of Gu Ru Zhang, famous for Iron Palm breaks. It then deals with some very basic theories and principles. Finally there are sections where six of the Shaolin core forms (Lien Bu Quan, Tan Tui and the four grandparent weapons sets) are shown in sampler style with no complete form being included. In addition there are some breakdowns of usage from the empty hand sets. Reading this we see that the “original” Shaolin has suffered a history of set-backs, often destroying almost all the information. Nowadays we can only see this or that Shaolin branch as closer or further from the ancient learning and, at best, a representative of some fragment from the Shaolin mural. "The Northern Shaolin Hook block is rarely seen in other martial arts styles." It's had to understand why something is "rarely seen" when it is as common as french fries. "It is important to never abandon any of your forms, even those you learned at the start of your training and even as you learn new ones." This denies the compounding effect of increasingly sophisticated practice. It describes an ideal state where everyone practices everything, forever. Of course this isn't true and the problem with writing it is not so much that it is wrong as wishful. Nonetheless, for a Northern Shaolin practitioner, a useful book to own. What makes this book valuable is the political, cultural, and historical background on both the temple and the generations that followed. Originally called "Ba Shan Fan" or Eight Turning Evasions, this is a famous boxing style in Northern China. Fan Zi, or Tumbling Boxing, is a powerful, tight, explosive style with turns and fast solid striking. It specializes in evasion with forceful counter-attacks. It emphasizes strong legs and stances. I am writing this on the Fourth of July and recall the descriptive phrase for Fan Zi: "Both fists strikes like a string of firecrackers." Such is synchronicity. It is also characterized by being "swift, violent and powerful." I think this is one of the better forms in this series of 'en face' (Chinese/Englsih facing pages.) The practitioner is strong and his movements definite and fierce. Though the movement and flavor in this Shaolin branch version is athletic, there are no fancy or extraneous actions here. Around 48 techniques to the whole form. 91 pages, English/Chinese text, and English/Chinese narration. What would Shaolin look like if it were played like Tai Chi? Here is a soft side to Shaolin and this is the major soft form of the style. There are notably some movements from Shaolin in Tai Chi Chuan (Strike Tiger for example) and this might in some way be some ancestor of Tai Chi. This series of movements takes many of the major actions of Shaolin and shows them in a slow, graceful format with occasional energy issuance. The text is accompanied by one VCD and a small pictoral review book. One of the most popular Shaolin forms we handle. NOTE: The VCD is marked #1. This is a stand-alone form. There is a second Rou Gong form, which can also be stand-alone, but this form is complete in itself. This is another of those McLisa editions, this time published by Meedea in Taiwan in 1989. Basically this is what some people call a mock up, an edition compiled from other sources such as little Chinese books on Shaolin. It has a certain charm in the sheer abandon where illustrations and sources sit next to one another like confusion cuisine. Nonetheless there are some interesting sections on the history of the style, redrawn versions of the famous five animals exercise, training methods for the arms, fingers etc. Also there are applications all draw in a style one might call just a step or two above stick figures. An interesting collector’s piece not entirely without merit. This new book by Paul Koh is, as he says, a contemporary approach that maintains a traditional attitude. "Secrets" introduces a basic view of the Five Element Theory and its application to martial practice, a section on Shaolin history, a photo essay on the basic stance. Next is a long practice partner set for Three Star conditioning exercises. This is followed by Koh's short and recombined "Five Elements" fist. Finally there is a two person Five Elements sparring section. While not exactly classical sets there is a distinct classical structure here with obvious influence from the Five Elements of the Hung Gar style. This short form is easily learned and the photos are exceptionally clear. As we've said before, though original these contributions partake of the rigor and structure of the traditional forms and are strong additions to the work. It's not a matter of just being "classical" but much more as we'll discuss some day. Our only wish here is that Mr. Koh gave fuller verbal instructions on the breakdowns of the sets. Directions are relatively sparse though, for an experienced practitioner, it is learnable. We feel as though we have an allied spirit here. In this volume teacher Wong Kiew Kit takes on the daunting task of answering the questions he receives through "e" and regular mail. He comments on such topics as Kung Fu, Taiji, Qigong and Zen. With astonishing patience he directs people toward the real understanding of these items. He continually returns to the core concept that, yes, there is something wonderful and quite amazing here and, no, the hard work part of its is not to be circumvented. As per our experience, it is sometimes astounding what people ask. Wong guides back from the fantasy to the even more exciting truth. This large book starts out with color plates including those famous murals from the Shaolin Temple walls. The rest of the book is done in the "cut out" photo sequences popular in the Sixties and Seventies. It starts with basics then proceeds to a short Southern style Bridge Set. Next is a partner set which, according to the text, has the essences of Tan Tui, Mantis, Eagle Claw, and LuoHan. The major set given is Nian Shou Quan or "Sticky Hand Boxing". This form is said to have been handed down from Sun Yu Feng, a great master of LuoHan Shaolin. The moves, obviously emphasize contact between the two partners. Many photos. "There is an actual system known as "Northern Shaolin." The main proponent of this system in the Twentieth century was GM Gu Ru Zhang. The director of Plum Publications own heritage through Wing Lam is from this lineage. Another branch of the school is through the teacher Wong Jack Man, well known in San Francisco Chinatown. One of his students, Rick Wing, has produced a book on a key form out of the Northern Shaolin lineage: #5 or Martial Skill. This is a good choice. First, it has never been exhibited in an English language edition. It comes from the "first half" of the system which is composed of sets around 40 movements long. But it is generally regarded as the most complex and interesting of this group. It is a great exhibition form and we've had a number of students win tournaments with it. It shows more of the Shaolin skills than a number of the other forms. Wing himself is enthusiastic about the system. He is also quite limber and that "sells" the Northern kicks a bit. He has a lot of style and shows a practiced skill with the sets. The book is laid out with form explanations shown in large and small photos. It shows both back and front views. He also discusses all the other forms in the core system and their practice and meaning. There is a nice history in the front and applications in the back. There are also sections on Gu Ru Zhang and Yim Shan Wu. Notes on the arrangement and meaning of the famous "ten core sets" help to give a feeling for the plan of the Northern Shaolin system. There are historical notes that will be useful to those researching Shaolin. If you are an enthusiast of Bei Pai Shaolin then this is a good addition to your library. Our only real criticism is that the photographs are a bit small. The applications section, for instance, is really too abbreviated to show much detail. Wong Kiew Kit is so enthusiastic about Shaolin Boxing that he has written an article attempting to prove that it is the "best" martial art in the world - and he has a pretty good argument, too. This book is a definite for anyone interested in Shaolin and Kung Fu generally. The text is what we call "generous" handing all sorts of topics with openess and information which, from a teacher's point of view, is of a higher caliber than generally available. Teacher Wong goes over Iron Palm training, Creating opportunities to secure victory, subtle forces, marvelous technique, weapons and how they are used, chi kung Shaolin style, symbolism in Shaolin poetry, curing disease. This book really tries to live up to its title. Tell me about Sifu Wong Kiew Kit. 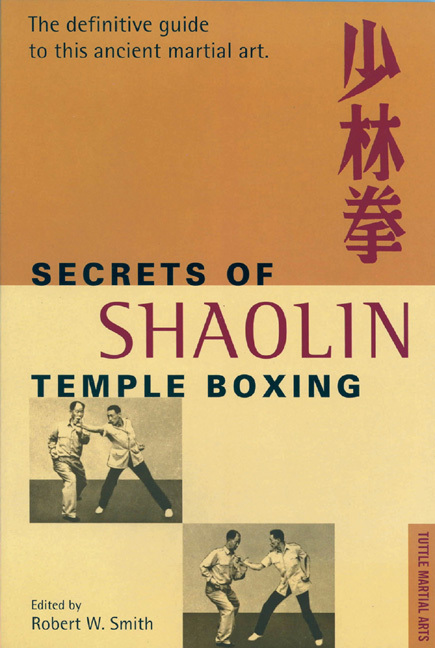 This is the first major book on Shaolin Temple Boxing in the English language. With this book Robert W. Smith, already a well known writer on Judo, established himself as a major authority on Chinese martial Arts. Actually a translation of a Chinese text on Shaolin, this book is abundantly and attractively illustrated with typical early Tuttle good taste and nice art direction. Not an instruction manual per se Secrets gives the true flavor of a Chinese boxing text. It contains, among other things, the 18 Shaolin Monk exercises, photos of a Chin Nah expert demonstrating basic hands and a little background on Shaolin history and philosophy. A fundamental book. This book is a compilation of different training methods such as you might see in some of the early Jackie Chan films while the Shihfu is taking a small break and a nap. Some of these are tradition methods from the Shaolin Temple. Some may be the inventions of novelist from the Ming Dynasty. Some defy the principles of physics and some are excellent specialty training methods. The original sources for this book, pamphlets often distributed from Shihfu to student, copied down, redrawn and rewritten are famous throughout the martial world. This is where Iron Skull, Chi Projection, Whip Strength and other methods were first shown to the public. Still a good, serviceable introduction to Shaolin Kung Fu and Wushu in general. 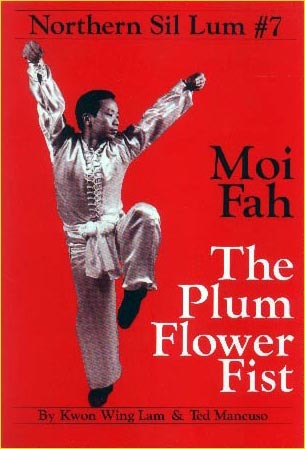 Published twenty years ago this is one of the books I recommend for people entering the Kung Fu world. Oversized and thick it gives a lot of information for the money. While sometimes light on distinguishing legend from fact, theory from practice; it is nonetheless a compendium of information covering basics, exercises, general fighting theory and form. A lot of concern went into this book. It also sports a lot of forms for the price (FIVE), demonstrating and showing applications for Lien Bu Chuan, Gung Li Chuan, Mai Fu Chuan (Ambush Fist), Shih Tzu Chuan and Shawn Fu Ien. Though these are only generically Shaolin they do represent the general category (Mai Fu is associated with Mei Hua style as is Shih Tzu Chuan, Shawn Fu is a praying mantis form and both Lien Bu and Gung Li are off the rack training forms or "linked fists."). You can't get hurt with this one. We strongly suggest buying both of these since they run in sequence. A neat collector's item reproduction of an old manuscript. For many years Tuttle was one of the finest martial arts and generally Japanese culture publishers on the planet. Split between Japan and their kitchen table in Vermont, this family- owned company uncannily produced great books while Ohara-Rainbow was reducing itself to formula publishing and Unique Publications was still a glint in Curtis Wong's eye. From this time great texts like this one on the Luohan system are still being republished. Basically anything by Draeger, whose main study was Japanese martial arts and who, we believe, developed an academic study of weapons known as Hopology, is worth collecting. Well thought out and presented. This small home-made pamphlet qualifies as a collector's item. It is Tak Wah's first book and an introduction to the Fu Jow system. A little collector's item of about 32 pages with illustrations and photographs this book introduced the Fu Jow to an unsuspecting world. The movements are nice and the applications are pretty good. We suspect that in the future these self produced booklets will be highly sought after because, in many instances, they record the hands on work of teachers and schools with no other goal than promoting their arts. Some students of martial history are claiming that Red Fist, Tai Tzu and Canon Boxing (Pao Chui) may be the group of forms from which Tai Chi was developed. The different Red Fists (Big and Small) are definitely considered basic and key forms of the Shaolin style. Both are translated in this text by Wang SiQian, student of Shi DeGen. 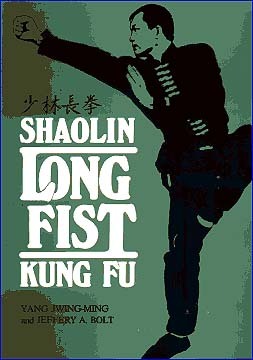 A very interesting book giving a couple of examples of Tiger Style Kung Fu. But, even of more note, this Shaolin form is handed down through the Beggar's style. Not that many people are familiar with this authentic branch of the Kung Fu family that specializes in beggar's and wanderer's Kung Fu. But historical sources reveal that Beggar's Fist might be one of the main styles contributing to the birth of classical Karate in Okinawa. This book not only expounds the Tiger Fist with 57 postures but also an Arhat Northern Kung Fu form. A neat little book in English and Chinese so you can study you language along with your boxing.